Our latest style of clear, frosted, high density custom shopping bags have a smooth, clean look. Complement with a colored tissue paper for a great look. Our clear, frosted, high density custom cub shopping bags have a smooth, clean look. Complement with a colored tissue paper for a stylish look. The White Dots Cub Clear Frosted Shoppers are versatile for use with many store applications. Complement with bold, colored tissue paper to give your bag a unique look. The White Dots Vogue Clear Frosted Shoppers are versatile for use with many store applications. Complement with bold, colored tissue paper to give your package a unique look. The White Dots Frosted Merchandise bags offer a trendy alternative to other retail shopping bags. These bags feature a white dot pattern on a clear frosted background. With a scatter print of white daisies, the Daisy Frosted Merchandise Bags are a very popular. The high density frost provides a smooth, clear look. Mix and match with other colored packaging goods for a great design. 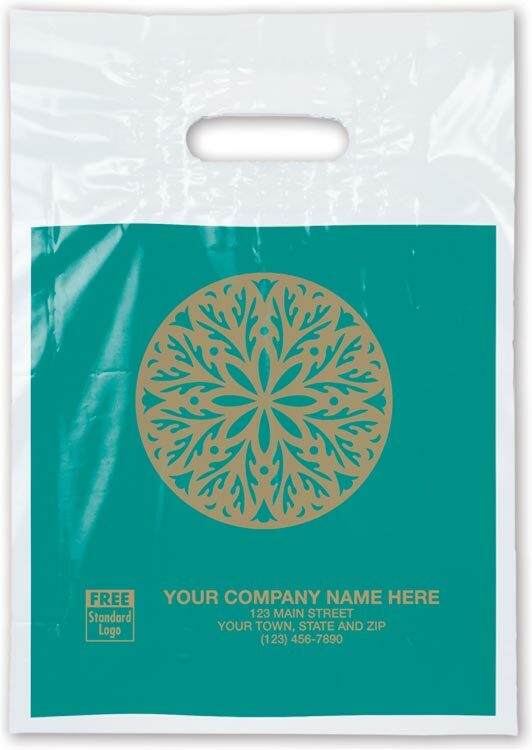 The White Dot Frosted Merchandise bags offer a trendy option for your retail store. These bags can be used for a variety of store applications. Scattered print of matte white dots cover both sides of these bags. The latest styling, our heavyweight clear frosted high density shoppers have clean look and are beautiful hot stamped. Economical packaging, these Clear Frosted High Density Merchandise Bags are the perfect choice. The latest styling, our heavyweight clear frosted high density shopper assortment offers you a variety in our most popular bag sizes. 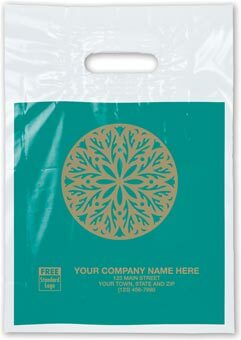 An elegant graphic design draws attention to your business logo printed on our fine-quality Medallion Plastic Bags.Expand your business's visibility with attractive, well-designed and personalized packaging. Promote your shop in style! Attractive bags are an essential to protect customer purchases. Plus, add your store name and you'll have a walking billboard.